The mob's fat man sang - and now he's coming back for an encore. Joseph Massino, the highest ranking Mafia canary to ever testify in a mob trial in New York, will take the stand again against former Bonanno boss Vincent (Vinny Gorgeous) Basciano. Massino's testimony helped convict Basciano of capital murder. Now, the roly-poly rat will try to convince the jury he deserves the death penalty for ordering the killing of mob associate Randolph Pizzolo. 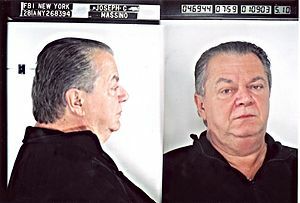 Massino was the official boss of the Bonanno family when he secretly taped Basciano in jail. After Massino was convicted of multiple murders, he revealed that Basciano wanted to kill prosecutor Greg Andres, and he agreed to wear a wire. "Massino is also expected to testify that he learned from an attorney at a co-defendant meeting ... that Andres ate dinner at an Italian restaurant with his boss," prosecutors stated in court papers. Another mob rat, Generoso (Jimmy the General) Barbieri will testify that Basciano "knew where to find Andres and that Basciano had a crew of capable enforcers," the papers say. The same jury that convicted Basciano this week returns Monday to determine whether he should die by lethal injection or get life in prison. Prosecutors will argue that Basciano was involved in numerous murder plots and remains dangerous even behind bars.